Here's a little info about me. How do I begin when we're all rewriting our own life's story everyday? Oh, gosh, I'm going to have to come back to this. I'm late for lunch and the laptop battery is almost out. 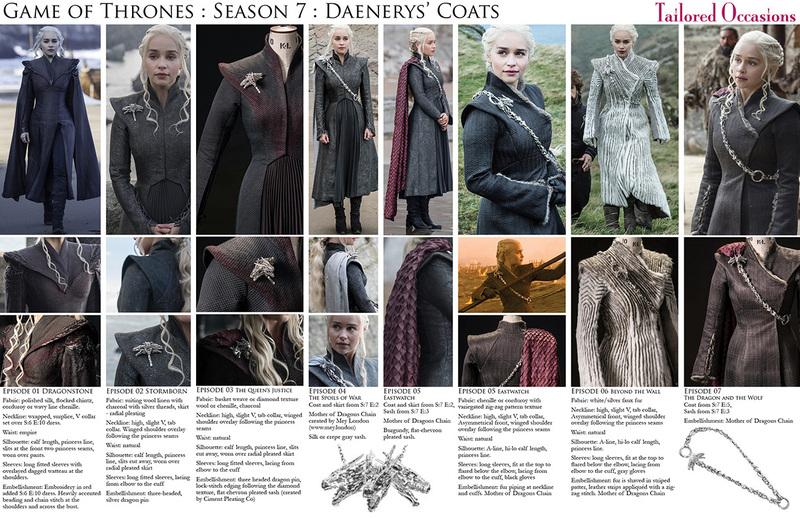 If you are a fan of HBOs Game of Thrones character Daenerys Targaryen, then your head may be swimming with the images of the gorgeous coats she wore during Season 7. I'm in love with the fabrics and the cuts. Each one is similar, with slight variations. I made this reference chart to keep them all straight. When I'm looking for fabrics, its helpful to have this near to compare to different options. I hope it is helpful for your, too. I hope you enjoy these composites! 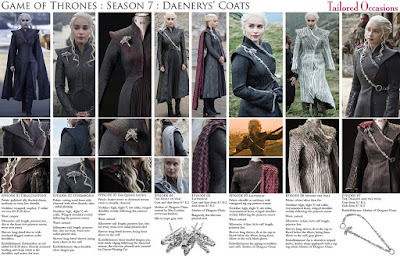 Costume replica notes and sewing pattern review. What else is there to say about HBO’s Game of Thrones character Cersei Lannister that hasn’t been said? Despite my mortal fear of her ruthless ambition to stay in power, I’m totally entranced by her wardrobe. That may have to do more with Michele Clapton and Michele Carragher’s spectacular costuming output. 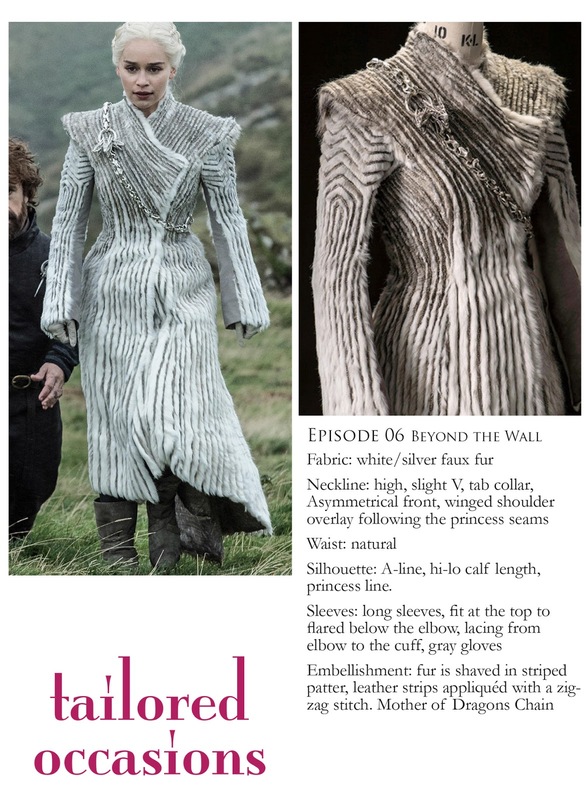 So if Cersei was to walk to red carpet, I’m afraid my feminist sensibilities would be trampled by my adoration of fashion and garment construction. I apologize for in advance for my failure to #AskHerMore. 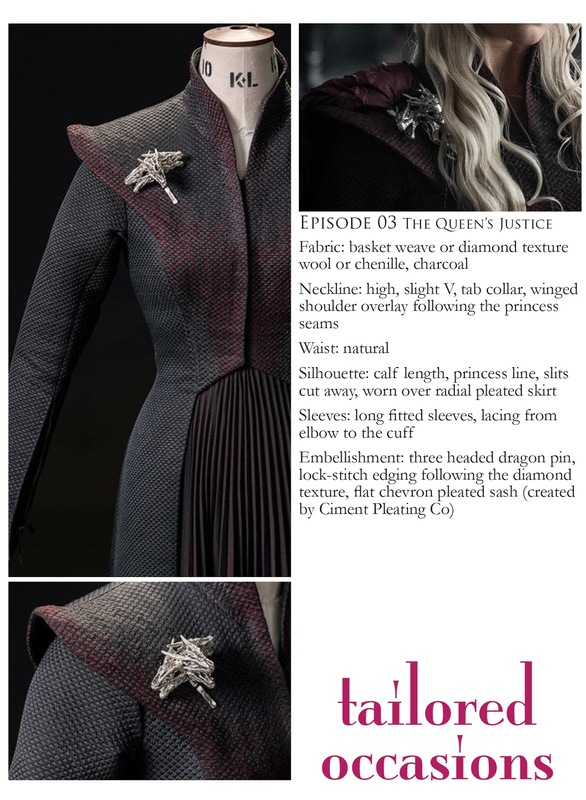 Here are some notes about constructing a replica of her season 1 and season 2 dress often referred to as the Blue Bird dress. It features a wrap front with some Asian influences in the silhouette, fabric and embroidery. 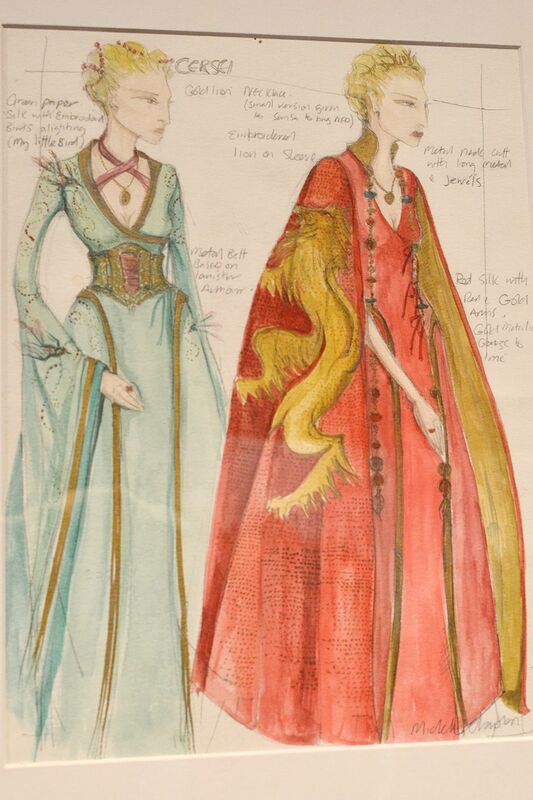 Below, are Michele Clapton’s illustrations of Cersei’s two well known costumes. If by chance you haven’t been on Michele’s portfolio site, please do. Along with seeing her stunning and unique creations, she’s very generous with explaining her process. McCalls pattern inspired by the HBO TV series Game of Thrones. 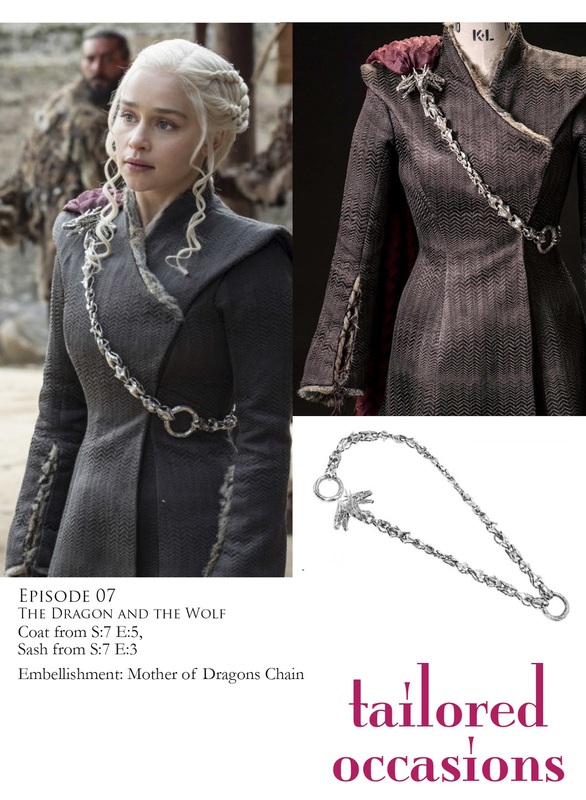 It covers two styles of costumes ranging from season 1 through season 5, as seen King’s Landing, in the fictional capitol of Westeros. 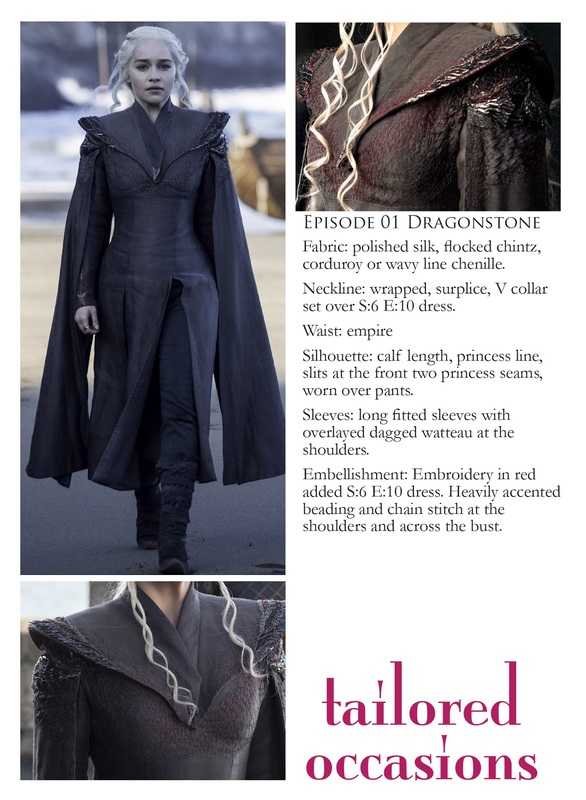 Character Cersei Lannister wears Pattern Style A, she wears seven versions. In Pattern Style B, there are four versions. 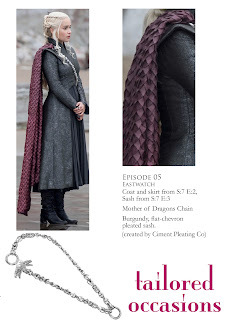 Character Sansa Stark wears Pattern Style A in at least two versions. I’m using the standard size 18 pattern lines. Next time I’ll do a FBA. I quilted three layers, and the top silk layer may have been pulled too much to accentuate the need for the FBA. 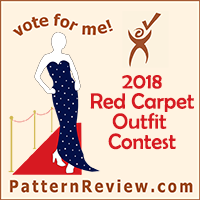 Did it look like pattern envelope when I was done? Yes. The pattern holds its look even while upsizing. Just bear in mind most of us don’t have a figure like Lena Headey or Sophie Turner. To keep it looking smart, use a stiffer main fabric or good interfacing. This will help it keep the silhouette, and smooth over body bumps. Take a moment to choose your fabric well if you can. My first instinct was to find something that had a fluid drape. 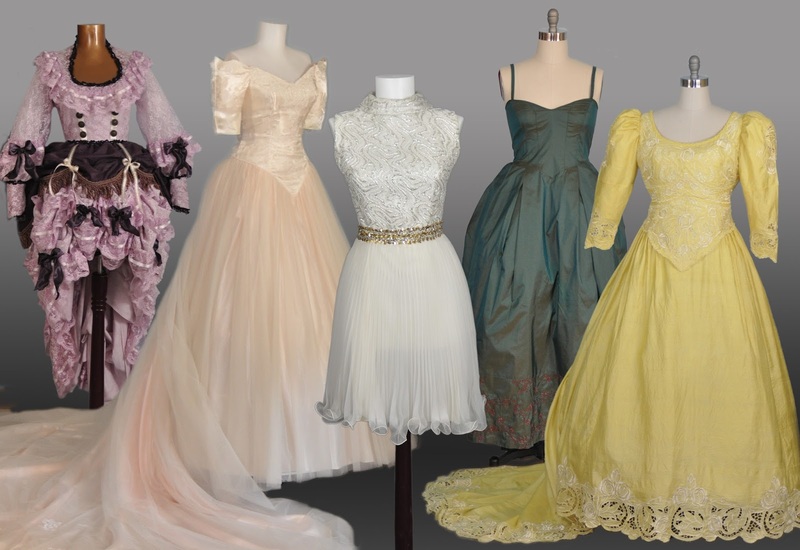 But to match the onscreen silhouette, a medium to firmer stiffness is best to make the cone shape of the skirt. If you choose a drapier fabric, add lining at least to the skirt or add horse hair to the hem. Yes, for me. For beginners I’d say yes, too. The versatility. The very close similarities and accuracies to the screen accurate version. 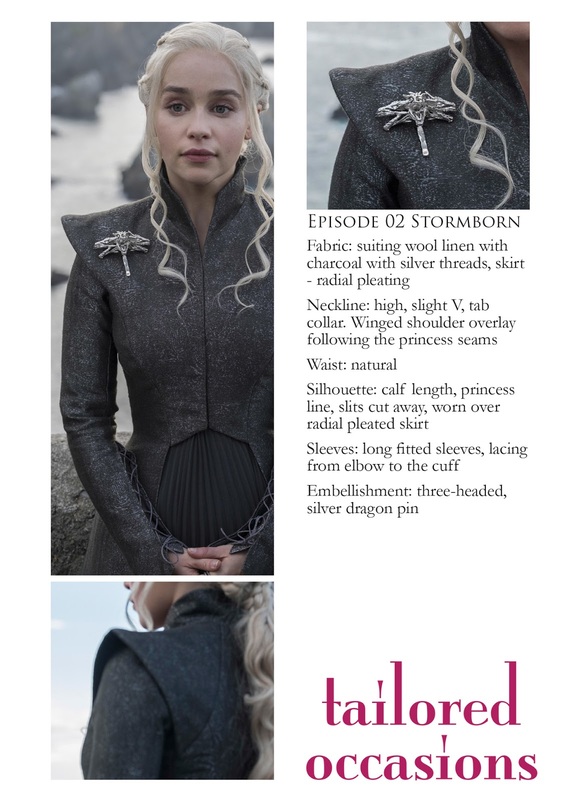 You can make this “quick and dirty” for a costume party (take at least one day or a weekend if a beginner) or you can jack this up with all the fancy fabrics and seam techniques to make it fit for a queen’s life. Not really any dislikes I can think of. If there were, I adapted as I went. Main Fabric: Robin egg blue silk (maybe tussah?) from thrifted curtains. They had a light cotton batting and a loose broadcloth lining. I cut and sewed it without separating them. It worked fine to cut stacked because I pressed the heck out of it. Piping: Mustard yellow, shredded sari silk ribbon for the piping. Contrast: Pastels and gold jacquard from curtains in my stash. Lining: vintage sheet that I tie dyed in a pink water color effect. Lining Contrast: repurpose Hollie Hobby/prairie girl quilt. 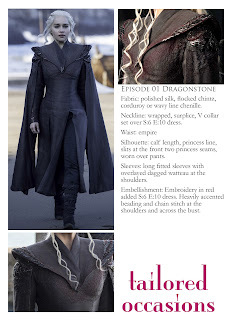 * No fit alterations, as I plan to wear as fancy house coat. Next time, there’ll be some minor adjustments in the bust. 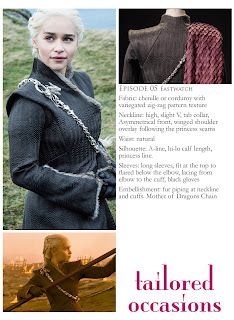 * Detachable dagged sleeves - I made the sleeves in three parts, so that the dagged sleeves are detachable. Where the dagged sleeve seam is, I sewed in a lower sleeve section, with ties in between the upper and lower sections. 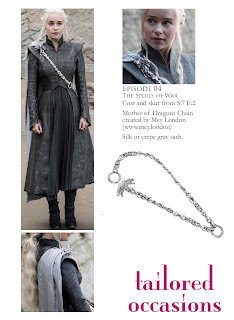 I’ll add ties to the dagged piece so that I can wear them if I ever don this for a costume event or convention. The detachable part is not photographed yet, to come. 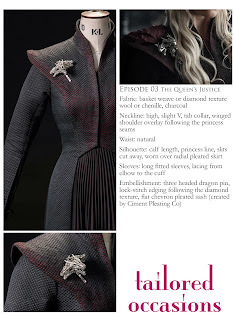 * Embroidery inspired by Michele Carragher, the costume embroidery designer on Game of Thrones. * Made it reversible. I like doubling the look, and I don’t have a serger. I hate zig zagging, and I’d rather spend the time doing a decent lining or reversible rather than the zig zag step. Yes, granted I can find the fabric I want, I’ll make this many times over. Shortened to midi length, this is an excellent day dress. This will be a portfolio piece for my shop on the popular handmade website. 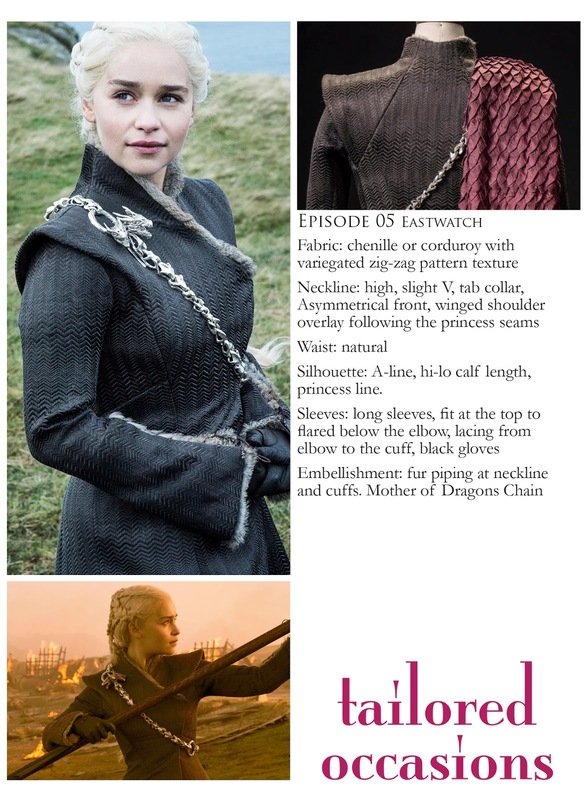 Easy to sew, the sleeves may be odd for a beginner, but follow the instructions and you’ll be fine. This will work well in many fabrics high and low quality to suit your budget and purpose. New gowns, costumes and treasures for you in our expanded Etsy shop! Tailored Occasions was privileged to be of assistance for two wonderful brides and their families. Saturday June 16, was the wedding day of Valerie and Kevin. I assisted with the reception at The Hollyhock House in Kewaunee, Wisconsin. Valerie graduated in May from UW-River Falls with a degree in Horticulture. The garden at The Hollyhock House was an ideal setting for her background and future in all things green and growing. Valerie's mother Kathy was especially super to work with and proud mom of a daughter whose beauty is both inside and out. Hello all interested parties. Welcome to the first installment of the Tailored Occasions blog. 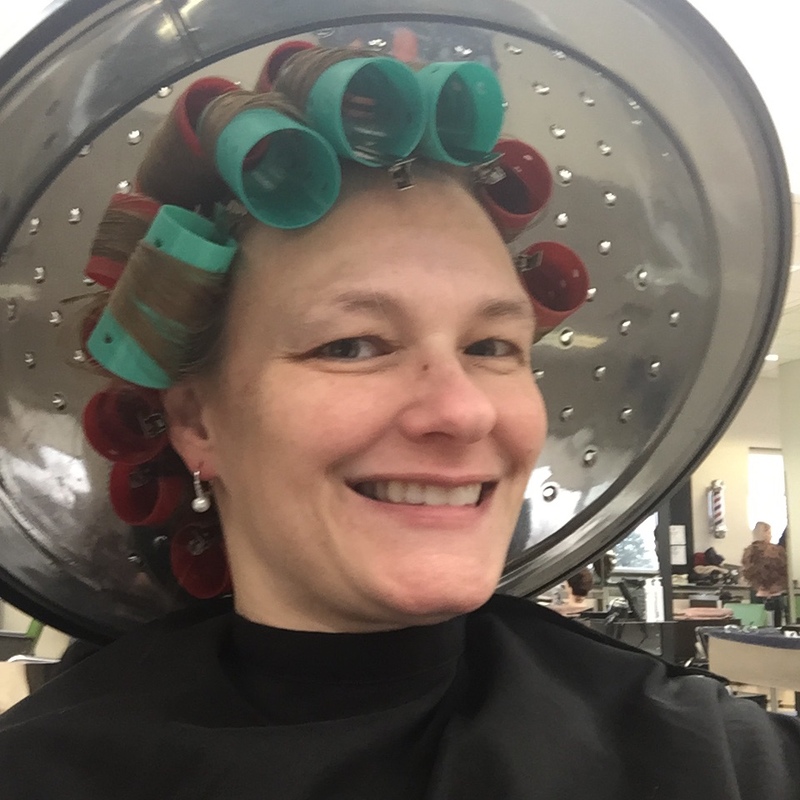 Please visit here if you are interested in the latest activities of Tailored Occasions wedding and event planning of the greater Green Bay, Wisconsin area.